Yes, I stay up late, but it rarely occurs to me to watch television. So I’m trusting in Jason Zinoman -- who covers comedy for the New York Times and has written the masterful Shock Value: How a Few Eccentric Outsiders Gave Us Nightmares, Conquered Hollywood, and Invented Modern Horror – to guide me through the intricacies of David Letterman’s unique career as a comic and talk show host. His new bestselling biography is called Letterman: The Last Giant of Late Night. I discovered through Zinoman that one of Letterman’s original comic idols was mine was well: the late, great Steve Allen, who brought to his TV hosting duties (on the Tonight Show and elsewhere) an antic spirit and a willingness to do pretty much anything (wacky visits to the Hollywood Ranch Market! custard pie fights with the studio audience!) for a laugh. Letterman, of course, did much of the same, dropping watermelons from high places and donning a Velcro suit to hang from the walls of his studio. Zinoman notes the similarities of these pranks, but also zeroes in on one key difference: “Steve Allen played the role of a game, if occasionally reluctant, guinea pig delighted to be part of his experiments. He followed jokes with a big, booming cackle. By contrast, Letterman didn’t appear to be having a good time, like a man forced into this situation.” What he contributed to the insanity onstage was his own ironic detachment. What we saw on his face, says Zinoman, was perilously close to misery. Zinoman’s point is that David Letterman, though highly ambitious and determined to make his way in the comedy world, seemed almost congenitally unable to enjoy the laughs he generated. 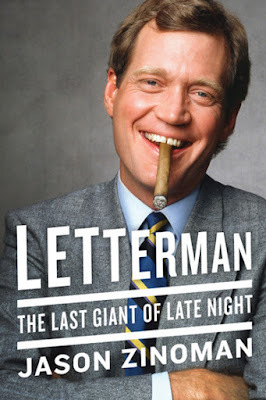 Zinoman carefully delineates the various stages of Letterman’s career, as he moved from an NBC morning show to NBC’s Late Night with David Letterman to CBS’s Late Night, as well as the crushing moment when he was denied the chance to follow Johnny Carson as permanent host of the Tonight Show. Letterman’s style evolved over time, but the man himself seemed to become less and less comfortable in his skin, and far less willing to collaborate with those whose job was to make him look good. But David Letterman is far from a total egotist. One of the most powerful moments of his career came in the wake of 9/11. Reeling from the disaster that had hit his beloved New York City, he spoke to his audience candidly and with great emotion. David Letterman moving beyond irony was truly something to see.